What would Google do, if it were a CPA? You might have seen the iconic rubber wristbands with the letters WWGD — or maybe you’ve read the book, What Would Google Do? by Jeff Jarvis. 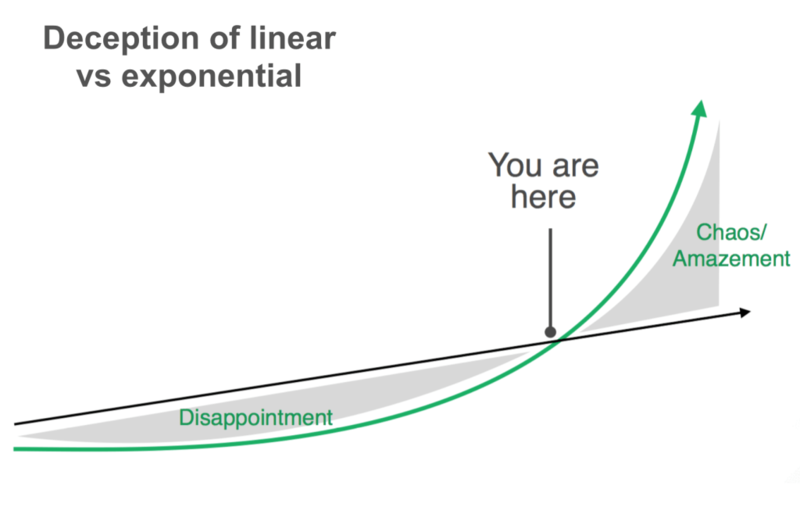 Pictured at left is the linear-vs.-exponential growth curve by Singularity University and Evolution partners in Australia. That acronym, WWGD, has become the mantra of people and organizations trying to make sense of this rapidly changing and complex world. To many, it means the legendary Google 20 percent time for innovation. For others, it is Google’s open and collaborative offices on the famous Googleplex. Still others see it as the way forward in a world of exponential change driven by the underlying success of Google — technology. The point is that we have entered the “second half of the chessboard,” as Moore’s law of exponential growth in processing power hits its 50th year. As the graph above shows, this is when the pace of change shifts from gradual to sudden. As Dan Burrus says, we have entered the “Big Deal” phase. Notice the labels under the curve shift to chaos/amazement, threat or opportunity. It is also why Burrus, a best-selling author and technology futurist, told us recently that in the next five years we will transform how we market, sell, communicate, educate, collaborate, and conduct business. Yes, that is transformation, not incremental change. That is why we are so excited to have Ari Balogh, vice president of storage and network infrastructure at Google, coming our CPA Summit on June 23 to discuss “The CPA’s Role in Today’s World of Disruption, Innovation and the Shift Change.” Or in other words, we will hear WWGD as it relates to CPAs. In his role at Google, Balogh sits at the epicenter of data storage, networking applications, and cloud engineering at one of the world’s leading information companies. Also at the Summit, you will be able to choose between two tracks focused on innovation, technology, and leading change through the “shift change.” Don’t take my word for it. Listen to what last year’s participants and sponsors have to say about it. The two tracks focus on how to make the shift change and the tools and technologies to help you. Others like Avalara, Tri-Bridge Partners, ThinkTank, Conferences.IO, PLIYP, Avalara, OpenBadges, and more will also be there. So if you are thinking about “What Would Google Do” if they were your firm or business or even you, come to the Summit on June 23 or attend virtually by webcast. Registration, agenda and information here.